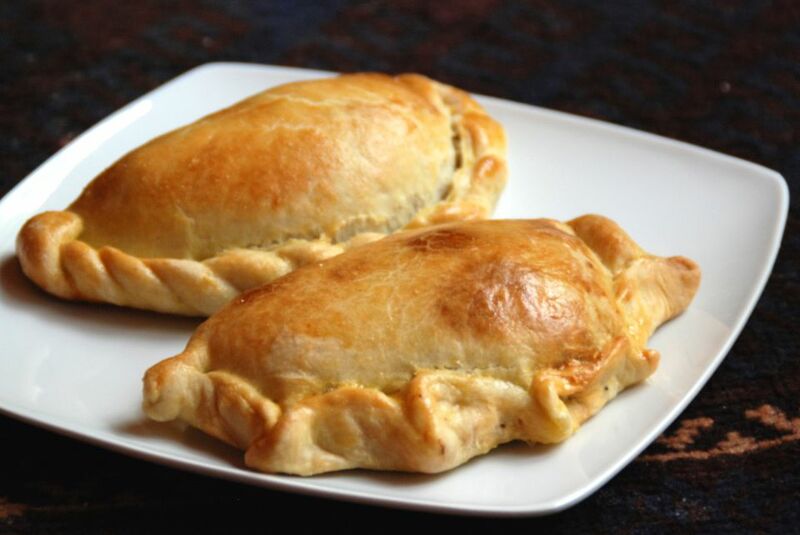 In Chile, the most traditional empanada filling is called "pino," which is a seasoned mixture of ground beef, onions, raisins and black olives and are topped with hard-boiled eggs. Empanada dough is quick and easy to make and can be prepared ahead and stored in the refrigerator. Pino tastes best if it's made the day before and allowed to rest overnight before filling the empanadas. The more you can do ahead of time, the easier it is! Note: while there are multiple steps to this recipe, this empanada dish is broken down into workable categories to help you better plan for preparation and baking. Sift the flour into a bowl and then stir in 1 teaspoon salt and the sugar. Blend the butter and shortening (or lard) into the flour mixture with a pastry cutter, or with two knives, until fairly well blended. Whisk the egg yolks with 3/4 cups water. Stir in the 1/2 cup of the water-egg mixture, a little bit at a time, until the dough starts to come together smoothly. Keep kneading the dough, adding more of the water-egg mixture as needed (you may need a few tablespoons extra of water), until the dough is smooth. The dough will seem a bit saggy until it has thoroughly chilled. Taste for salt and add more if needed. Cover the dough with plastic wrap and refrigerate for about 1 hour. The dough can also be kept in the fridge for up to two days. When ready to use, the dough should be soft and smooth, not elastic. If you poke a hole in the dough with your finger, the indentation should remain. Melt the vegetable oil and butter in a skillet over medium-low heat. Add the chopped onions and cook, stirring frequently, until the onions are softened and fragrant. Add the ground beef, cumin, chili powder, paprika, beef bouillon, and salt and pepper to taste. Cook the beef, stirring and crumbling the meat with a spatula, until well-browned. Add the flour and continue to cook for 2 to 3 minutes. Remove the skillet from the heat and stir the raisins and black olives into the beef mixture. Let the filling cool completely. The filling will keep up for up to two days in the refrigerator. Separate the empanada dough into golf-ball-size pieces and roll into smooth balls. Let the dough balls rest for 5 minutes. On a floured surface, roll each ball of dough into a 6-inch circle about 1/4-inch thick. Add 1 tablespoon of the ​beef filling and a slice of hardboiled egg to the middle of the circle. Brush the edges with water and fold the pastry in half over the filling to make a semi-circle. Seal the edges by pressing down with your fingers. Brush the sealed edge lightly with water, then turn the edge toward the middle and press with your fingers to seal. Mix the egg yolk with 2 tablespoons milk and brush the empanadas with the mixture. Bake at 350 F for 25 to 30 minutes or until golden brown.